The New Orleans mint, which began producing coins in 1838, minted its first Liberty Seated Quarters in 1840. The struggles of the early mint are evident in the coinage produced during the 1840’s, including the many interesting varieties of seated quarters. Amongst those varieties are some “mintmark size varieties”. The large O mintmark was used on the no drapery quarters of 1840, the small O mintmark on the with-drapery quarters of 1840, ‘41, ’42, and ’43, and the large O again on all 1844 and subsequent quarters produced prior to the civil war. Both of the transitions, from large to small mintmark in 1840, and from small to large in 1843-44 produced rare transitional mintmark varieties. The 1840 With Drapery Large O has already been discussed in some detail. 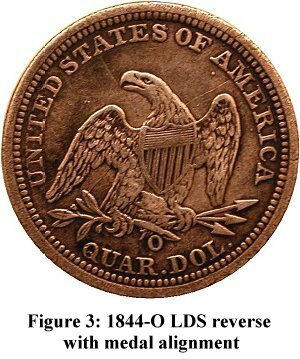 This column will focus on the 1843-O Large O and the 1844-O minted using the same reverse die as the 1843-O Large O. Lot 1434 - 1843-O Large O. MS-65. A superb specimen, a dazzling gem, almost certainly the finest known to exist – not just barely the finest, but far and away the finest. Consider, for example, Larry Briggs’ statement, “Unkown in Uncirculated.” Consider also Walter Breen’s comment in his Complete Encyclopedia of U.S. and Colonial Coins, “Always in low grades, unobtainable choice.” Thus, even a MS-60 coin would be memorable. The present gem MS-65 is simply incredible! Off the market for generations, this piece will certainly be a stellar attraction in the cabinet of its next owner. The 1844-O with Reverse of 1843-O Large O, in addition to needing a much shorter name, is far more difficult to attribute because all 1844-O quarters have large mintmarks. The variety was, in fact, only discovered (by LSCC member Ray Lathrop) after publication of Larry Briggs’ Comprehensive Encyclopedia of United States Liberty Seated Quarters. In addition to being many times more rare than the 1843-O Large O, the 1844-O also has an even lower average grade. The two finest known at present are a cleaned example with XF40 details and a slabbed PCGS VF35. The 1844-O with Reverse of 1843-O Large O comes in both coin and medal turn (i.e. 180 degree die rotation) and exhibits quite heavy reverse die cracks in later die states. The variety with die rotation appears to be the more common of the two, but this is very likely due to the relative ease of attribution in comparison to the variety without die rotation. Those familiar with the die characteristics seem to encounter the two types in about equal numbers. Figures 1 through 3 illustrate the die states of the 1843-O Large O reverse die. Figure 1 is an early die state as paired with the 1843-O obverse. 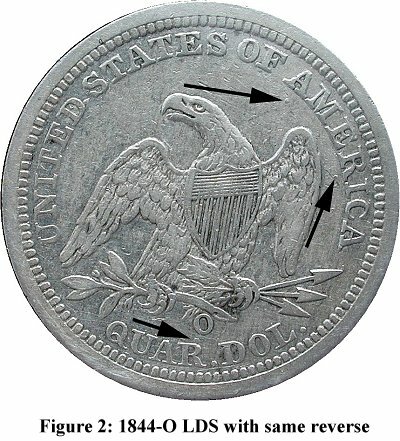 Figure 2 is a later state (but still prior to the die cracks) paired with the 1844-O obverse with coin alignment. Figure 3 shows the reverse die when paired with the 1844-O obverse with medal alignment. Note the mintmark location on all three coins, the prominent die lumps also present on all three coins, and the die cracks evident in the late die state of the medal turn 1844-O in Figure 3. Figure 4 shows the same coin as Figure 3 with the first die crack highlighted and labeled. This crack is seen on some examples of the 1844-O with coin alignment (i.e. prior to medal alignment coins being struck). 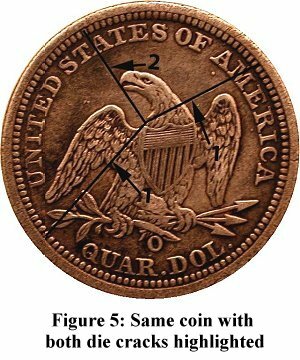 Figure 5 shows the same coin as Figures 3 and 4 with both die cracks highlighted. All known specimens with medal alignment have both die cracks. 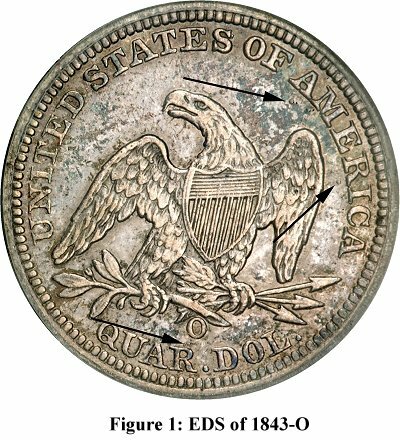 Because there are so few higher-grade specimens of the 1844-O with reverse of 1843-O Large O, it is possible that there are either coin alignment examples with both cracks or medal alignment examples with only the first crack. If anyone has an example of either of those die states please contact me via the e-Gobrecht editor.